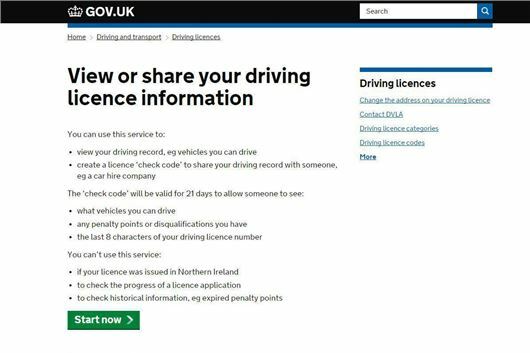 After howls of protest at the ridiculous 72 hour licence check validity, the DVLA has now extended the period of validity of a UK licence check to a reasonable 21 days. The system at https://www.gov.uk/view-driving-licence was introduced to replace the old photocard paper counterpart (or old paper licence) that previously listed endorsements. The idea is you get onto the website, key in your driving licence number, key in your national insurance number and key in your post code. The system then generates an access code or, if you go through a few more stages, a print-out of your driving licence entitlement and any endorsements on your licence. Ridiculously, the validity of the code or the print-out was previously only 72 hours. Sensibly, the validity of both has now been extended to 21 days. To help reduce queues at UK and European car rental desks, it makes more sense to generate the print-out before starting your trip than to rely on the car rental people to use the code to access your details.